No, I haven’t read Bird Box. But Josh Malerman’s A House at the Bottom of a Lake was enough to make me a fan. 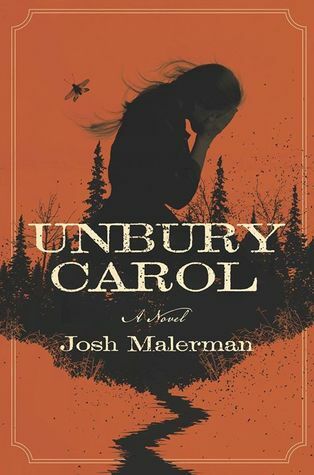 And when I read the synopsis of his newest novel – Unbury Carol – I knew I had to read it. (From Goodreads) Carol Evers is a woman with a dark secret. She has died many times . . . but her many deaths are not final: They are comas, a waking slumber indistinguishable from death, each lasting days. The premise of Unbury Carol is definitely what caught my attention. I rarely read horror (I’m a chicken) and I don’t think I’ve ever read a western, so this isn’t the kind of book I usually pick up. But the plot seemed so interesting and fun that I had to give it a shot. And, honestly, I was disappointed. The story itself is really interesting. There are a lot of fun characters, and I like that it doesn’t seem like a traditional western. But the pacing ruined this book for me. So many things are happening that seem like they should be urgent (someone is going to get buried alive, and an assassin is chasing down the man trying to stop it), but they are so drawn out all the excitement just evaporates. Once I hit the middle of the book, I was just bored, which is a weird sensation when you’re reading about gunfights and horse chases. At its core, the story is fairly really predictable. I was waiting for the moment that Malerman turned everything on its head and that never happened. There was a tiny twist at the end – admittedly, it was pretty cool – but everything else, I saw a mile coming. It was a little bit reminiscent of a romantic comedy in that way. Everything felt too easy. But, because this is a Josh Malerman book, there is of course a weird magical element. Which could have made this book so much more interesting, except that I did not care for it one bit. It felt kind of forced and it wasn’t explained well enough, in my opinion. I found myself wishing this was a simple, predictable western without all the weirdness. It just didn’t work for me. While I didn’t exactly dislike Unbury Carol, it was just so clear that it had potential to be something amazing and it wasn’t quite there. It was good, but it wasn’t great. The characters were interesting, the story was really original, but the execution fell flat. I think Malerman’s slow style works well with his other novels, but it really clashed with the action of this story and I couldn’t get past it. I do give him credit for a wonderfully unique story, though. I haven’t read anything like this before, and I really liked how imaginative it was. ★★★☆☆ – Three stars feels a bit generous, but I liked Unbury Carol more than the books I’ve recently given two stars, so I’m going with it. It wasn’t a bad book per se, but I don’t think I’d necessarily recommend it (even if you are a Malerman fan). I am curious to see what other people think, so if you’ve read (or are planning to read) Unbury Carol, share your thoughts in the comments! Unbury Carol will be available in bookstores starting April 10 (you can preorder on Amazon now). To get the audiobook for free, use this link to sign up for a free trial of Audible and choose Unbury Carol as one of your two free books. i was looking for some western books recently. i haven’t read any before either. It kind of was. But you never know – you might still enjoy it. I thought this was overall an okay read with some interesting parts and concepts. Me review goes live tomorrow. I have been having fun reading the various reviews of this one so far. I agree. Looking forward to reading your review!